Charlie Finn had to grow up fast, living alone by age sixteen. Highly intelligent, he earned a life-changing scholarship to Harvard, where he learned how to survive and thrive on the outskirts of privileged society. That skill served him well in the cutthroat business world, as it does in more lucrative but dangerous ventures he now operates off the coast of Miami. Charlie tries to separate relationships from work. But when his choices produce devastating consequences, he sets out to right wrongs, traveling to Central America where he will meet those who have paid for his actions, including a woman and her young daughter. Will their fated encounter present Charlie with a way to seek the redemption he thought was impossible--and free his heart to love one woman as he never knew he could? Charles Martin has been given an incredible gift from God in that he see's humanity so clearly. His writing is deep, raw, and real. If it doesn’t pull a plethora of emotions from you I would be very surprised. If you don’t want to know whether or not this book ends happily or sadly don’t read further (just read the book because it is incredible!). 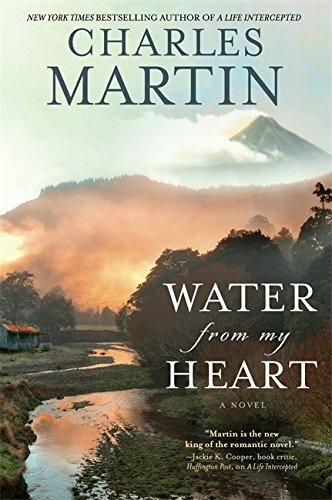 In Water from my Heart, Martin artfully draws the reader down to the very pit of the protagonist Charlie's life. The beauty though is that he doesn't leave you there. Light shines through circumstances and more importantly the people that are placed in Charlie’s life. I found myself greatly desiring to have the character of Paulina, Raul, and Alejandro and the contentment and pride of those who lived in poverty but not squalor. Even more, the work ethic, patience, and acceptance of the people of Nicaragua was thoroughly inspiring, yet those qualities also drove a thorn into my heart. I have been given much but I am not nearly that content. I can spend more than they make in a day on a cup of coffee (you will see this analogy used more than once in the book). Charlie felt mired in a lifetime feeling of dirtiness. Wisdom shown him by those stronger than him, the literal wallowing in the dirt, and the pride of those who are poor but not squalid stood as a looking glass to him. Love allowed him to accept what he saw. The book ends with a chapter called “On Digging a Well”. This is the true story regarding the inspiration for the book. Don’t read ahead…leave it for the end. It brought me to tears in a good way. As a reviewer for NetGalley, I received a review copy of this book in exchange for my honest and unbiased review. My thanks to NetGalley, the author, and publisher. Christy and I married in 1993. If you include dating, I’ve known and loved her for more than half my life. She is and always will be the home for my heart. We have three boys. Charlie, John T. and Rives. Folks often ask me, which of my books do I like the best. You might as well line up my sons and ask me who I love the most. My hobbies are bow hunting, working out (a blend of old school stuff and martial arts, called Fight Fit) and Tae Kwon Do. In October 2012 I earned my black belt but I’m still the least flexible person you’ve ever met. The guy that trains me, laughs everytime I start warming up. My boys are far better at Tae Kwon Do than I but I doubt they have as much fun – I get to do and watch. They just do. I also like to write, but that’s another story.